A day late but not a dollar short, it’s time for the latest Anime Limited Newswire~! We hope you had a great Easter weekend. Here’s the latest update on all things Anime Limited for you. ~ Our new release this week is the DVD version of Wings Of Honneamise. (The Collector’s Edition Blu-ray/DVD Combi version is being released on 27th April.) You can order both versions from Amazon UK HERE and through our web shop HERE. ~ Speaking of Wings of Honneamise we posted a comparison of older footage of the film compared to this HD Remaster we’re bringing to the UK. You can find this comparison HERE. In case you missed it you can read the announcement of our partnership with Viewster HERE. 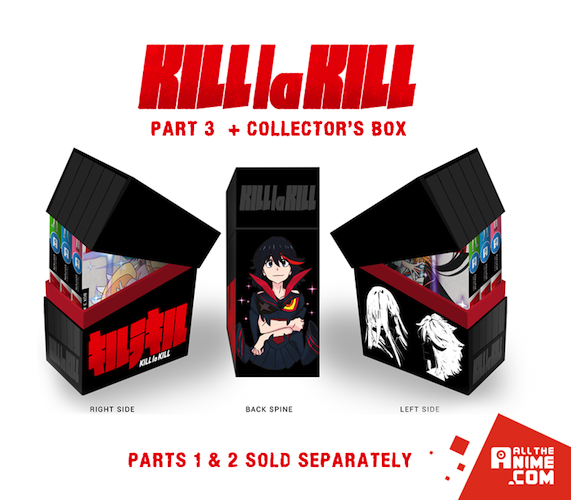 ~ If you’re a Kill la Kill fan you’re going to want to check out what will be coming with the first print run of our Part 3 Collector’s Edition Blu-ray and DVD release as there will be a UK Exclusive Collector’s Box to hold Part 1-3 included! You can get all the details (including availability of the Collector’s Box itself) HERE. You can pre-order Kill la Kill Box 3 today from Amazon UK HERE and at our web shop HERE. What is Seraph Of The End? ~ A quick note to say that our release of Tiger & Bunny – The Rising [Collector’s Edition Blu-ray/DVD] is now going to be released on 25th May. This is due to a delay in receiving assets from the licensor. It will now be available on the same day as Kill la Kill Box 3! ~ You may recall a while ago we talked about our intention to release a movie twin pack containing both Tiger & Bunny: The Beginning and Tiger & Bunny: The Rising movies. Unfortunately this no longer an option for us to release. This is because the two films have different production committees and as a result it’s really difficult to be able to put the films together as we intended. We are still exploring other options that may be possible for us when it comes to a potential Standard Edition of each Tiger & Bunny film in the UK, but we have no other details than that at this time. As soon as there is any update to this we’ll be sure to make it known. These two notes has been updated in the Release Schedule accordingly at the conclusion of this update. ~ For all of you Gundam fans out there, Gundam The Origin I: Blue-Eyed Casval is now available for on-demand streaming. You can get the details (including information on a Season Pass for all parts of this series) HERE. ~ A quick reminder that our deal of the month at our web shop throughout April is the standard edition Blu-ray of Space Dandy Season 1 for only £19.99! Get the details HERE. ~ In case you missed this news, we’re working with our partners in Japan to help launch the Hakuoki game on iOS and Android devices in the UK. You read the details of this HERE. If the name sounds familiar to some of you reading this, our friends at MVM Entertainment released the series here in the UK. The game is available to add to your add to your smartphone devices today. You can get the free version iOS HERE, Premium iOS version HERE, free version on Android HERE and Premium android version HERE. ~ For those of you eagerly waiting for news about the Scotland Loves Anime 2015 film festival all the way in October we can today exclusively reveal that the Glasgow Weekender will take place between 9-11th October and festivities in Edinburgh will take place during the week of 12th-18th October. There’ll be updates incoming soon on the official website, LovesAnimation.com, soon so we encourage you to keep an eye on that. However please note that no details relating to the 2015 festival are listed on the Scotland Loves Anime website, Glasgow Film Theatre website or Edinburgh Filmhouse website at this time. Q: Now that the simulcast season has officially started, can you confirm what days the episodes will be available on Viewster? All going well new episodes of Seraph Of The End should be available every Saturday afternoon/early evening and new episodes of The Heroic Legend Of Arslan should be available by lunchtime every Sunday. (The launch date/time for Plastic Memories is still TBC at this time.) This is still to be 100% locked in – while material deliveries are isolated and such. Once we have more concrete news we’ll be sure to say, but we will make it known on our website and on our social media channels once a new episode is available. Here’s the list of upcoming events we’ll be attending in some capacity. *Tentative date – not final. If you have any questions on any of the above please feel post them in the comments below or via our Twitter and Facebook.